Capt. Eugene P. Wilkinson, Commanding Officer of the world’s first nuclear-powered vessel, the U.S. submarine USS Nautilus (SSN-571), reported by flashing light signal that Nautilus was “Underway on Nuclear Power” for the first time on 17 January 1955. This milestone was enabled by a series of bold actions in the 1940s and early 1950s that laid the foundation of the U.S. Naval Nuclear Propulsion Program. 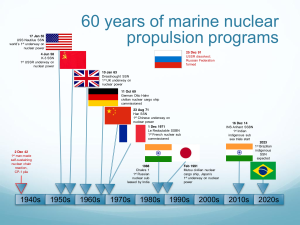 In the 60 years since Nautilus’ first voyage on nuclear power, marine nuclear propulsion technology has become widely used in naval vessels of the U.S., Russia, Great Britain, France, China, and recently, India. Other nations have had programs in place to develop naval nuclear propulsion capabilities during the past 60 years. Use of nuclear propulsion has revolutionized the roles of submarines in the world’s navies, enabling their long-duration, stealthy operation as platforms for intelligence gathering, strategic deterrence, tactical land-attack, anti-ship / anti-sub attack, and special operations force (SOF) support. To a lesser degree, naval surface ships, particularly aircraft carriers, have benefited from nuclear propulsion as a means to deploy faster to distant locations and remain on station longer with less logistics support. However, aircraft carriers and most large surface combatants do not operate independently, and their operations can be constrained by a slower supply chain that is needed to support the carrier battle group. Russia is the only nation currently operating civilian nuclear-powered vessels. On 15 September 1959, the icebreaker Lenin became the world’s first surface ship to get underway on nuclear power. Since then, Russia has operated a fleet of nuclear-powered icebreakers and soon will deploy a floating nuclear power plant that can be employed in remote locations, including sites along the Northern Sea Route in the Arctic. No other nation currently operates a civilian nuclear powered vessel. Operating experience in the 1960s and 70s with the N.S. Savannah (U.S.), Otto Hahn (Germany), and Mutsu (Japan) failed at the time to demonstrate a business case for civilian nuclear-powered vessels, which was complicated by a lack of adequate port nuclear infrastructure and public opposition to these vessels entering certain ports. 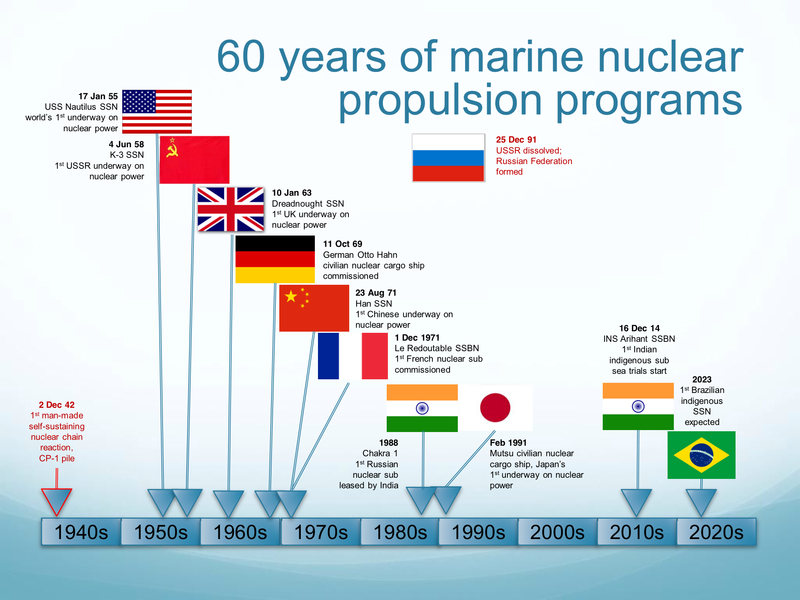 The nations that have developed and operated naval and / or civilian nuclear-powered vessels during the past 60 years are shown in the following timeline chart. All of these naval and civilian marine nuclear propulsion programs will be addressed, from inception of the programs through decommissioning and recycling of former nuclear vessels. Also addressed are nuclear propulsion programs in other nations that: (1) are actively developing their first nuclear-powered vessel (Brazil), (2) have discontinued development of nuclear-powered vessels (Italy, Canada), or (3) may be aspiring to develop an indigenous nuclear-powered vessel in the future. The Arctic is one area where marine nuclear propulsion offers unique capabilities that cannot be matched by other means. The current interest of nations bordering the Arctic in exploiting resources in the region, or simply protecting their national interests in the region, has sparked recent Arctic exploration. The historical role of nuclear-powered vessels in Arctic exploration and likely future roles will be addressed. One legacy of marine nuclear propulsion is the loss at sea of several U.S. and Russian nuclear-powered submarines and the ocean dumping, primarily by Russia, of other damaged submarines, nuclear reactor cores and other nuclear-related material. This environmental issue also will be addressed. “This rather lengthy presentation is my attempt to tell a complex story, starting from the early origins of the U.S. Navy’s interest in marine nuclear propulsion in 1939, resetting the clock on 17 January 1955 with the world’s first “underway on nuclear power” by the USS Nautilus, and then tracing the development and exploitation of nuclear propulsion over the next 60 years in a remarkable variety of military and civilian vessels created by eight nations. I acknowledge the great amount of work done by others who have posted information on the internet on international marine nuclear propulsion programs, naval and civilian nuclear vessels and naval weapons systems. My presentation contains a great deal of graphics from many internet sources. Throughout the presentation, I have made an effort to identify all of the sources for these graphics. If you have any comments or wish to identify errors in this presentation, please send me an e-mail to: PL31416@cox.net. Based on feedback from the Naval Submarine League, Pete made changes to the presentation regarding the US. In addition, he made a small change to the one regarding arctic operations. The links above will take you to the updated presentations.